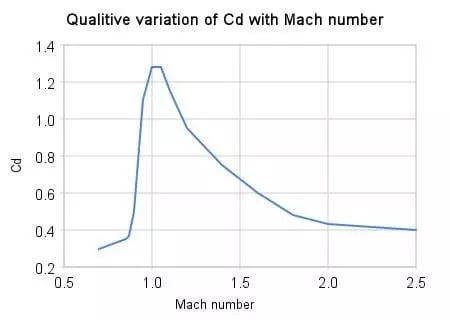 The photo was obtained from Wikipedia and represents the relationship between the speed of a supersonic projectile (Mach number) and the coefficient of drag (Cd). Cd can be thought of as a surrogate for ballistic coefficient. Notice that as the supersonic speed of a bullet decreases to the speed of sound the drag increases. The rate of drag increase (curve slope) increases significantly starting at Mach 1.8 or so and peaks as the bullet reaches Mach 1. At that point the drag rapidly drops. We have seen in extreme long range shots (2900+yds) a BC increase in our 260 gr PICBM bullet from 0.835G1 at 2200 yds to 0.911G1 at 2950 yds. Our ballistic calculator predicted a supersonic range under the conditions of the test of 2400 yds, so the sudden increase in BC was attributable to the transition of the bullet to subsonic speed. Of note is that the bullet had to strike the target to record a BC measurement so it was able to negotiate the transition to subsonic accurately. This particular bullet has been observed by our customers to travel in excess of 1200 yds subsonic beyond the transition from supersonic flight. There are marketing implications of this phenomenon of changes in drag with velocity. It is obvious that bullets do not have a single BC. For simplicity sake manufacturers quote “a BC” for each of their bullets. We do as well. The rub comes in when comparing different bullets from different manufacturers. For Bulldozers we use the G1BC we have observed at 500 yds. For extreme long range work we quote a BC one would see at Mach 1.7, but advise that that is simply a starting point for load development since at extreme ranges where the bullet might be traveling at Mach 1.2 or less, the drag on the bullet will be higher and the observed BC likely will be lower until the bullet becomes subsonic. What this means is that for any range beyond 2000 yds the quoted BC may be too high with the result that the bullet hits low. In that case decrease the BC used to calculate the trajectory at the range one is shooting so that ballistic calculator will calculate the appropriate elevation settings for the scope to hit at the range one is shooting. This advise applies to any bullet traveling far enough to reach transonic speed.